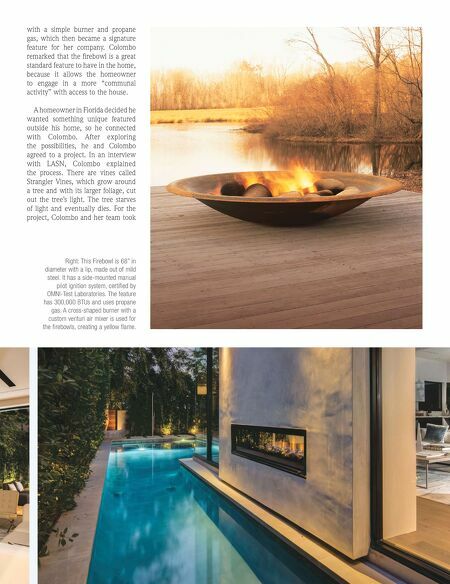 26 Landscape Architect and Specifier News Many projects are incorporating fire features that can be enjoyed from both sides of a wall, such as this Indoor/Outdoor Tunnel 200 located at a residence in Los Angeles, Calif., designed and installed by Ortal Heat of Canoga Park, Calif. It is a two-in-one system with a 160 burner and a sealed window to the outside. Such 3-dimensional displays can include amenities like a television or piece of art. 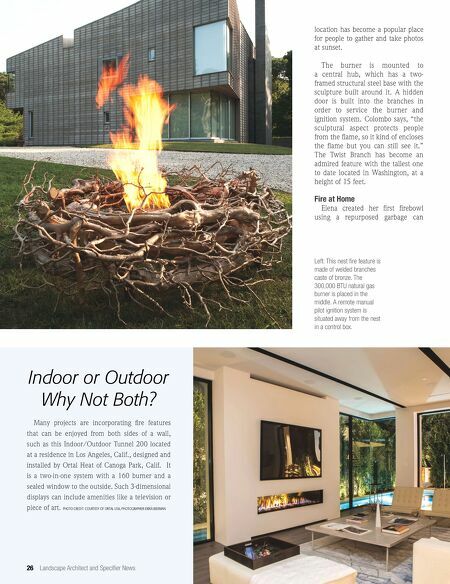 PHOTO CREDIT: COURTESY OF ORTAL USA, PHOTOGRAPHER ERIKA BIERMAN Indoor or Outdoor Why Not Both? location has become a popular place for people to gather and take photos at sunset. The burner is mounted to a central hub, which has a two- framed structural steel base with the sculpture built around it. A hidden door is built into the branches in order to service the burner and ignition system. Colombo says, "the sculptural aspect protects people from the flame, so it kind of encloses the flame but you can still see it." The Twist Branch has become an admired feature with the tallest one to date located in Washington, at a height of 15 feet. Fire at Home Elena created her first firebowl using a repurposed garbage can Left: This nest fire feature is made of welded branches caste of bronze. The 300,000 BTU natural gas burner is placed in the middle. A remote manual pilot ignition system is situated away from the nest in a control box.